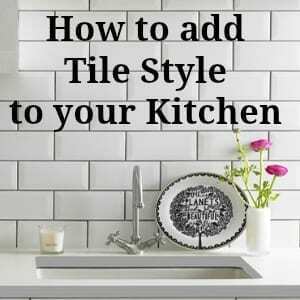 To create a post full of Tile inspiration for your home has been on my list of things to do for ages and finally I’m managing to pull it together. Using tiles in your home can be daunting and often quite uninspiring, so I’ve been wanting to write about the fabulous ways you can use tiles now to really add some flair and modern design into your kitchens and bathrooms. If you’re in the process of redesigning one of these areas, or maybe starting to think that you’d like to, I’ve put together some very interesting ways to make tiles a focal point in the room, and not just a boring necessity. Texture isn’t just for textiles, rugs and throws. You can add depth and warmth with tiles too believe it or not. Just take a look at these: The brick tile on the right of the picture is actually a porcelain, matt finish tile that gives a sophisticated, rich look and really adds some depth to the scheme. Isn’t it gorgeous? And practical too! Mosaic tiles have been around for a while, and still remain popular. I have some in my kitchen installed around 8 years ago and the still look good today. But there are lots of different ways to use mosaic tiles to really good effect, so don’t be afraid to experiment. This last image is made up of glass metallic random mosaic mix tiles and I think looks stunning. Mix and match them to create your own individual, unique look. You can’t go wrong. What a style statement! In the past we’ve usually created a practical splashback from the tiles we’ve used in the rest of the kitchen, but did you know you can buy tailor-made spashback areas that complement the rest of your scheme? Sleek and contemporary, these splashbacks offer a striking alternative to tiles. If you feel brave enough to go for one. As with all catwalk and fashion trends, colour blocking has found its way into the home interiors arena too. Using tiles and colour in this way will create an incredible statement in your decor, and you’ll be bang on trend too. The contrast between the Aubergine and Lime metallic glass tiles makes quite a statement and sets the tone for the rest of the room design. The trick is to not shy away from vivid colours and really let your imagination run free! A way of using tiles that came into fashion several years ago and has remained popular. Build your tiles brick wall style, using any and all kinds of patterns. Or keep it really simple for clean lines and minimal style. I hope you’ve enjoyed my Tile fashion roundup today and it’s given you some inspiration for new ways to use Tiles in your home. They really are a key element to any kitchen or bathroom design now and you can use them to achieve pretty much any interior design you would like to. All of the tiles I’ve featured here are from the Topps Tiles website so do go and take a browse over there for more lovely images and Tile inspiration. A great feature article! As someone who has re-styled and re-tiled 3 bathrooms, a hall and a kitchen in the last 12 months, I have been amazed by the variety available. The other thing which has really amazed me is the difference in prices between products. It really is worth chatting to the people “in the know” as they can very often make practical suggestions about options that may save you hundreds of pounds! Anyone who knows me will know that I love colour and I have always believed that careful use of key features and colours can make a room come to life. It is great that lovechicliving.co.uk is a constant source of practical inspriation! What a fantastic collection, very inspirational. I liked all of them but I fell in love with “Modern Metro” brick wall style tiles are awesome. Wow Jen, these mosaic tiles are simply breathtaking. I totally agree that tiles are a key element is every kitchen or bathroom. If they are properly installed, of course. very nice blog for sharing information about tiles…..